The Wine Enthusiast Steady Temp Martini Glasses feature a unique mouth-blown, double-wall design that provides extra insulation, so your martini stays at its proper serving temperature regardless of how long you've held the glass. Keep cool drinks cool! The Wine Enthusiast Steady Temp Martini Glasses feature a unique mouth-blown, double-wall design that provides extra insulation, so your martini stays at its proper serving temperature regardless of how long you've held the glass. It also creates a "suspended" visual effect for a compelling presentation. Stable, durable double wall martini glass made of lead-free glass. Does this come with a taller base? BEST ANSWER: No this is the only size these glasses are available in. BEST ANSWER: A layer of air insulates the beverage with this double wall style glass. Yes temperature would be retained since not coming into contact with a warm hand. What country are these glasses made in? Thank You! BEST ANSWER: Thank you for your inquiry. These glasses are made in the USA. If you have any further questions, please feel free to reach out to us at 800 356 8466. Thank you again. These glasses were mouth blown in the USA. There have been conflicts about whether this is actually a set of two rather than a set of four. How many are actually in a set? Is this available in a set of 2? I like the glasses for reasons stated: keeps the martini cold longer, and has a good substantial feel in your hand (at least my hand, and have had many compliments from guests). One caveat: after extended dishwasher use the plug in the little hole at the base of the glass will eventually fail, which will allow water or vapor into the double wall chamber, causing a cloudy effect. I would suggest hand washing to avoid this. Only negative about this product is that the brand logo on the bottom shows through the glass. It almost looks like something is on/in the glass, or that a label was not removed properly, since the etched design was done in white and can be seen while drinking your martini. We like a martini up and in the summer, but the drink warms up very fast, so we decided to try these insulated glasses. There are small imperfections in the glass, but the design and weight of the glass is nice and they function great. A cold drink without ice does not cause the outer glass to sweat but if you include ice, there is a small amount of 'sweat' but nothing at all like a single walled glass. They are a reasonable value and I would recommend. Beautiful way to enjoy the cocktail hour! They work perfectly, keeps your Martini from absorbing the heat of your hand. Base could be possibly a half inch taller to make picking up the glass easier for folks with larger hands. They add a beautiful touch to your bar setting, highly recommended. I bought these for a friend and she absolutely loved them ! These Steady Temp glasses are a great show. Love those martini glasses. The double walls make everything stay cold. But don't wash them in the dishwasher. There is a tiny plug in the bottom of the glass which will eventually come out and ruin the glass if you put them in the dishwasher. We tried a set of two to evaluate. They work very well in slowing the warming, so ordered an additional set of four. Chose these over the type that sit directly on a bed of ice as it seemed neat and clean with no drips or water rings on the table. I'd been wanting double walled martini glasses for a few years before I got these. I looked at bodum, but not only were they more expensive than these, they seemed much more delicate. I'm still a little afraid these will break easily despite the fact that they feel a lot sturdier than the bodum--however, that hasn't stopped me from washing them in the dishwasher. I also like the stability of the design with the wide bottom, and it looks really attractive with the drink "suspended." And most importantly, it keeps your drink nice and cool. I'd highly recommend these, and will probably purchase some as gifts for family. One glass arrived with a tiny hole in base. Water went inside on first washing. Wine Enthusiast promptly replaced glass.Even sent an extra. Keeps the drink cold a long time. Sturdy, but breakable so treat them nicely. These also make terrific serving glasses for dips, nuts, etc. Great glasses. 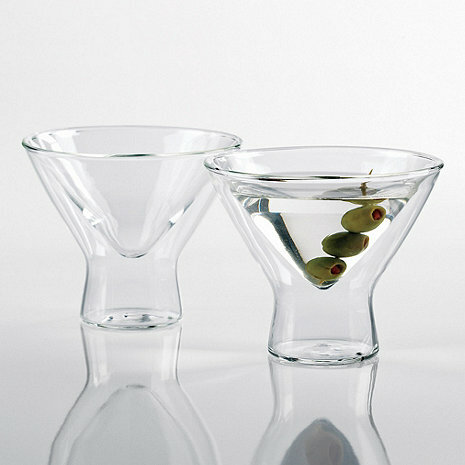 We love these because they are much easier to handle than traditional martini glasses. Great product.. very much needed. Very practical if you want a chilled, shaken martini in the hot weather. Yes. No. Yes, customer service was available and helpful, replacing the broken items with no problem and no hesitation, and the personnel there were very helpful and kind. I cannot say enough about the excellence of service and delivery performance. Good beyond compare. The original delivery had a broken glass. I wrote, the repair was made and delivered, I am overjoyed. And this glass looks so good held in my hand. These are the coolest martini glasses. The 'suspended' effect is visually pleasing. They keep your martini nice and cold much longer in hot weather! We have had no problems with cleaning. They are great! i purchased these when we were in Florida for a month and our drinks kept getting warm. They really do keep your martinis cold longer, and they're nice looking too. I plan to order more when I get back home. Highly recommend! This shipped promptly, but got stuck en transit for a few days before arriving a little later than I expected. Well packaged. Perfect condition. My martinis stay cold, the way I have to have them. All the double wall glasses are so wonderful !!! I hardly use stem glasses any longer. Great looking and they keep your martini cold. A little harder to pick up with no stem but holding the bowl in your hand does not heat the drink. I would buy these again. Love them because they won't tip over .... keeps liquid very cold. Really like that they can't be knocked over ... have bought for my vacation home as well. Anyone for a COLD martini? Any kind of mixed drink that I want to stay cold. These glasses are always a big hit when I entertain. We love them for everyday use too. They help to maintain the temperature and they are easier to use because they are stemless. I bought these martini glasses to use as dessert dishes; i.e. granitas, ice cream, etc. They make a large serving, too! Wonderful! A summer must have! If you like your martini to stay ice cold longer, these glasses are for you. Just leave them in the freezer until you're ready to use them. Keep these in the freezer and when you add frozen vodka, they truly keep it cold. They are pretty sturdy and I have owned some for almost three years and they've never broken. They also fit easily on the top shelf of the dishwasher. They were wonderful for home dirty Vodka Martinis. Just be careful who you are drinking them with. My drinking buddy was a little inexperienced with the concept of Vodka and paid for it later, but that was his issue, not the glasses. These are fun glasses to enjoy an extra chilly martini of any kind. I have always kept a glass in the freezer but with these there is no need to. I bought the red wine stemless for a Christmas gift; my friend loves martinis and he really likes these glasses. Martinis, cosmopolitans, side cars all look great in this glass and stay at serving temperature. I have small hands and this can feel a little big for them, but since it does not sweat it is still easy to hold. These glasses have been a lot of fun for serving drinks. The base is wide enough that it is very stable. Nice way to present and sip a martini. A fun way to present a martini. I mean a glass is a glass but this one makes you look twice and maybe even reflect once again on what makes a perfect martini. Good for everyday/anytime use. I expected the drink to stay cool much longer, but guests were impressed with the temperature constancy. I would say icy temp is guaranteed for at least 30 minutes, then you have a slow rise in liquid temp, but it's still chilled. Glasses wash well in the dishwasher top rack. I keep mine in the freezer for extra cold impact. Sturdy design and ease of handling are a plus. We travel with friends and have a nightly cocktail party. Occasionally like a cold martini to drink leisurely - this does the trick! Really does the job keeping your martini cold. Surprisingly lightweight. Beautiful design but it is difficult to get it to fit in my dishwasher. Maybe the spacing in my rack is narrow. These seem to keep a martini pretty cold through the drinking process. The lip is a little thick and seems incongruous compared to a standard martini glass, but you get used to it. They were a gift for my husband and he likes them a lot...especially the way they keep his martinis cold after shaken. At first he had a little trouble getting used to picking them up because they are stemless but now he thinks they are great.